Today is the birthday of James Cook, British explorer and navigator, born this day in 1728. While of Scottish descent, his shadow looms so large over the history of New Zealand (and Australia) that he may as well have been an honorary citizen of the region. A man of skill and courage, Cook made three great voyages of discovery to the Pacific Ocean, and it was during the first of these that, among other things, he became the first European to reach the eastern coastline of Australia, and the first person to do a circumnavigation of New Zealand. He was the second European to reach New Zealand, 127 years after Abel Tasman. His mapping of the coastline of New Zealand was amazingly accurate and detailed, and he named many of the landmarks he discovered, including Cook Strait, the section of ocean separating New Zealand’s North and South Islands. 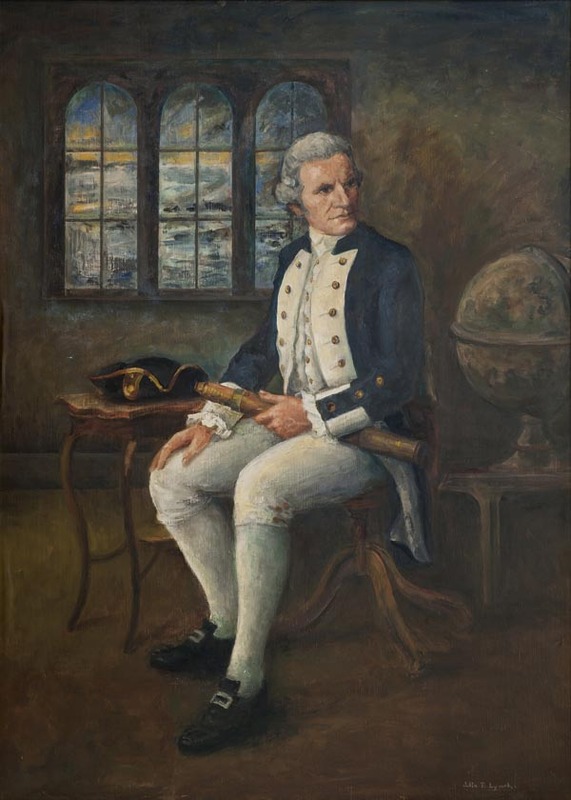 A painting of James Cook, by New Zealand artist Julia B Lynch, on display in the James Cook Hotel in Wellington. An interesting tale about his first Pacific voyage is that he was initially engaged by the Royal Society to travel to Tahiti from where he was to observe and record the 1769 Transit of Venus. Unfortunately the separate measurements taken by Cook, astronomer Charles Green and Swedish naturalist Daniel Solander, differed significantly, making the results from the measurements less conclusive than was hoped. All was not lost, however, as there was a secret second part to his voyage – he had sealed orders from the Admiralty containing details of the second part of his voyage – he was to search the south Pacific ocean for the fabled rich continent of Terra Australis. These orders were kept secret to give the British the best chance of discovering Australia under the guise of an innocent scientific expedition to perform astronomical measurements. Cook apparently had doubts about the existence of Australia, but thanks to the help of a Tahitian called Tupaia, who was an expert in the geography of the Pacific region, the second part of his journey proved highly successful. Cook first reached New Zealand in October 1769, mapping it in its entirety over a period of 6 months, before voyaging further west to reach the south-eastern coast of Australia. A hilly, forest-covered country – quite a succinct description for New Zealand, and probably not all that different to my first impression of the country as I gazed out of the airplane window when I first arrived here almost 240 years after Captain Cook.